Use click and collect and enter code SALETREAT. Possible TCB? Only M and L sizes. The fact that Tesco sells this makes it not cool. Tesco makes the Beatles uncool? They're selling hippy wigs in Woolworths man. © Danny the drug dealer. 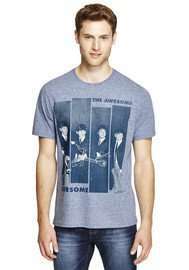 I bought a Ramones t shirt in Argos recently...... I didn't realise that I've now made this influential rock band uncool. I shall burn it at once.